Brexit is scary, welcome or intriguing, according to taste. Those tendering a welcome are those who were most eager to bring about a Leave vote in the first place. Some polls suggest that their numbers may have been depleted somewhat by progress, or lack of it, since the referendum in 2016. But no matter. There are those who look forward with real zeal to Brexit. And the scary segment? That perhaps encompasses those who fret at the absence of precision, thus far, on such matters as trade, travel and the island of Ireland. 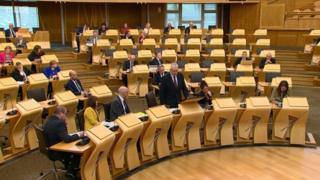 Then we have the intriguing element which emerged during today's statement in Holyrood by Mike Russell, the Minister for Mitigating Brexit (inasmuch as such an endeavour is feasible, which the minister himself doubts). There was on display a multi-dimensional constitutional chess game. For example, Willie Rennie of the Liberal Democrats urged Mr Russell to endorse, finally, a "People's Vote". By which Mr Rennie refers to the prospect that there might be a plebiscite to cast a verdict upon the final terms resulting from the Brexit negotiations. The notion has gained traction by drawing support, in principle, from the TUC. For the avoidance of doubt, this would in no way be a second Brexit referendum. Put that unworthy thought from your mind. Different construct entirely. Ach, enough, Brian, it is an idea which is gaining ground and worthy of attention. Now the SNP have a range of objections to such a poll. Firstly, a fair number of their supporters voted to leave and might not welcome a rerun. Secondly, the Nationalists might fret a little about setting a precedent for any future independence referendum. If they finally won such a vote - after eighty years of endeavour - would they then be obliged to subject the terms to a confirmatory ballot too? Mr Russell produced another point. The people of Scotland, he informed Mr Rennie, had already delivered their verdict upon the EU. They wanted, mostly, to remain. What would happen, he inquired, if Scotland again voted to remain, only to be thwarted again by the UK perspective? On a related matter, Adam Tomkins of the Conservatives reminded Mr Russell - as he has done so many times previously - that Scotland had also voted, mostly, to remain in the United Kingdom in the referendum of 2014. The Conservative constitutional argument arising from this is that the 2014 outcome means that Scotland forms part of the combined electorate in the 2016 EU poll - and consequently is included within that overall UK verdict. Earlier, Mr Russell cited another plebiscite: that which established Scottish devolution, the referendum which took place 21 years ago today. He argued that it was an outpouring of democratic decision-making, a statement of Scottish popular sovereignty. This element, he said, was now being jeopardised as Scotland's verdict on the EU was treated "with contempt". See above for the Tory perspective on that, accepted, one presumes, by those who adhere to a generally Unionist view. But Labour's Neil Findlay added another dimension in a customarily caustic aside. The doctrine of popular sovereignty, he appeared to imply, was associated with the cross-party Constitutional Convention - which the SNP had not ended up supporting. Had Mr Russell but world enough and time, he might perhaps have noted that the SNP did endorse the prior Claim of Right, asserting Scottish popular sovereignty, despite their later stance on the convention. As I said, intriguing. For the scary or welcome bits, please await further developments which will be faithfully recorded here.